Highway 1 is the main route of the Trans-Canada Highway through British Columbia. Its total accumulated distance through British Columbia is 1,039 km (646 mi), including the distance travelled on ferries. It is the westernmost portion of the "Highway 1" designation of the TCH through Western Canada, which extents to the Manitoba-Ontario boundary. The Vancouver Island branch of Highway 1, known locally as the Island Highway (a name shared with Highway 19), is the main thoroughfare on the south Island. The highway was first given the "1" designation in 1941, and originally went from Victoria to Kelsey Bay, a small coastal community north of Campbell River. Highway 1 on the Island was shortened to terminate in the downtown core of the city of Nanaimo in 1953, with the section north of Nanaimo being re-numbered 19. When BC Ferries took over the ferry route between Departure Bay in Nanaimo and Horseshoe Bay in West Vancouver in 1961, Highway 1 on the Island was extended to the Departure Bay ferry dock. The Island section of Highway 1, which is 116 km (72 mi) in total length, begins at the intersection of Douglas Street and Dallas Road in Victoria, where a large "mile zero" sign is erected. Highway 1 proceeds north through the city of Victoria for 4 km (2½ mi), passing by the southern terminus of Highway 17, before leaving the city at Tolmie Avenue. Once out of Victoria there are three at grade intersections at Boleskine Rd, Tillicum Rd and Mckenzie Avenue (currently being converted to an interchange - opening 2019). Between Tillicum and Mckenzie there is a limited interchange at Interurban (south bound off-ramp). Highway 1 then continues on a 10 km (6.2 mi) long four to six lane freeway, with five interchanges along its length, one of which leads to the start of Highway 14 until the Leigh Road/Bear Mountain Parkway overpass in Langford. After its signalized intersection with the Westshore Parkway, the highway narrows to two lanes as it enters Goldstream Provincial Park. The highway from this point is known locally as the Malahat. From the southern entrance to Goldstream park, the Malahat section of Highway 1, which is known for its steep grades, goes north for 20 km (12 mi). It follows the Goldstream River through the park to the west shore of Finlayson Arm, becomes three lanes on its exit from the park, and passes through the community of Malahat proper, as well as the Malahat Summit, the highest point on the Island section of Highway 1 at 352 m elevation, en route. The Malahat portion of the highway is a mix of 2, 3 and 4 lane cross-sections. 65 per cent of the Malahat highway is divided with concrete median. The Malahat section ends when it reaches the community of Mill Bay. In Mill Bay, Highway 1 once again widens out into four lanes (with an interchange at Mill Bay Road at Bamberton), then passes through signalized intersections at Butterfield Road, Frayne Road and Deloume Road. Highway 1 then travels north through a gauntlet of 15 traffic lights for 29 km (18 mi). These provide access to Shawnigan Lake (stoplights at Shawnigan Lake Road), Cobble Hill (Cobble Hill Road, Hutchinson Road and Fisher Road), Cowichan Bay (Cowichan Bay Road, Koksilah Road, and Bench Road) and Duncan (closely spaced signals at Allenby Road, Boys Road, Trunk Road, Coronation Avenue, James Street, Beverly Street, Green Road, and Drinkwater Road). Next is a signalized junction with Highway 18. The highway then proceeds north for 10 km (6.2 mi) through stoplights at Mays Road and Mount Sicker Road to a signalized intersection at Henry Road serving Chemainus. From the Chemainus junction, Highway 1 travels 11 km (6.8 mi) northwest to the city of Ladysmith accessed by intersections with traffic lights at Davis Road, Roberts Street, and Ludlow Road. It then continues northwest for another 13 km (8.1 mi) through signalized junctions at Oyster Sto-Lo Road, Cedar Road, Timberlands Road, and Spitfire Way, the last of which provides access to Nanaimo Airport. The highway then reaches an unsignalized junction at Cassidy. Immediately after crossing a bridge over the Nanaimo River, there is an interchange with Nanaimo River Road. There is then a signalized intersection at Morden Road. Highway 1 enters the City of Nanaimo about 6 km (3.7 mi) north of Cassidy, where Highway 19 merges at an interchange onto the highway from the B.C. Ferry terminal at Duke Point. The two highways follow a short freeway that reaches 7 lanes at its widest point. It runs another 2 km north (1¼ mi) to a point where Highways 1 and 19 split off at a junction with Cedar Road. Highway 19 proceeds northwest to bypass Nanaimo, while Highway 1 continues north through the city of Nanaimo for 7 km (4.3 mi) to the B.C. Ferry terminal at Departure Bay, where the Island section of Highway 1 terminates. Highway 1 then enters Departure Bay via ferry, turning east-northeast to enter the Strait of Georgia just north of Newcastle Island. The downtown core of Vancouver comes into view as the route approaches the entrance to Howe Sound. The highway then turns north-northeast just west of Passage Island to enter Queen Charlotte Channel, then rounds the Whytecliff Peninsula to enter the Horseshoe Bay ferry terminal, 57 km (30 nmi) from the Departure Bay dock. Highway 1 through Metro Vancouver and the Fraser Valley, highlighted in red. Ferry traffic on Highway 1 at the Horseshoe Bay Ferry Terminal. Highway 1 as it enters Vancouver from Burnaby. Like its Island section, the Highway on the Lower Mainland was first given the "1" designation in 1941. Highway 1's original alignment started out within the city limits of Vancouver, and followed Kingsway from Vancouver to Surrey, and then went along the Fraser Highway to Clearbrook. From Chilliwack, the highway originally went to Rosedale, which is a community just east of Chilliwack, along Yale Road, then along Flood-Hope Road to where it picks up its current alignment just across the Fraser River from Hope. In 1959, Highway 1 was given an extension from within Vancouver to Horseshoe Bay by way of the Lions' Gate Bridge and Taylor Way in West Vancouver. In 1962, the section between Clearbrook and Chilliwack was re-routed to a new expressway. In 1964, the Clearbrook-Rosedale section of Highway 1 was restored to its original alignment. Also in that year, a new expressway (or "freeway"), originally designated as Highway 401, opened up on Highway 1's current alignment between West Vancouver and Rosedale. The expressway became part of Highway 1 in 1973. In 1986, Highway 1 between Chilliwack and Hope was improved to a freeway. Through the 1990s, all signals and intersections on Highway 1 through Greater Vancouver were removed, making the entire section of Highway 1 between Horseshoe Bay and Hope a freeway. In 2011, Highway 1 between 152nd Street in Surrey and Highway 11 in Abbotsford was designated as the Highway of Heroes. The 4 km (2½ mi) long stretch of Highway 1 through the eastern part of Vancouver is the only freeway within Vancouver's city limits. HIghway 1 from Vancouver to Coquitlam is the busiest segment of the entire freeway in the Lower Mainland. In Vancouver, Highway 1 travels through the Cassiar Tunnel and passes through three interchanges before crossing into Burnaby at the interchange with Boundary Road. The Burnaby stretch of Highway 1 is 11 km (6.8 mi) long, and goes through four interchanges before proceeding into Coquitlam. 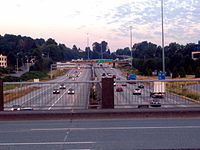 The Coquitlam stretch of Highway 1 lasts 7 km (4.3 mi), with two interchanges along its length, the westernmost of them also connecting to New Westminster. The easternmost interchange on Highway 1 in Coquitlam, known as the Cape Horn Interchange, leads to Highway 7 and Highway 7B. Leaving Coquitlam, Highway 1 crosses the Fraser River over the Port Mann Bridge into Surrey. Sections of Highway 1 from Grandview Highway in Vancouver to 208 Street in Langley vary from being 3 to 4 lanes in each direction and shortens to two lanes after leaving Langley (Metro Vancouver) and enters Abbotsford (Fraser Valley), with one of these lanes being a high-occupancy vehicle (HOV) lane. These HOV lanes were constructed in 1998 as part of the BC MOT's "Go Green" project to promote the use of HOV vehicles, and cost 62 million dollars. In Surrey, Highway 1 has five interchanges - 152 St (accessed by getting in rightmost lanes before the Port Mann Bridge), 156 St (HOV only), 160 St/104 Ave, one that connects to Highway 15 and Highway 17, and 192 St. 12 km (7.5 mi) east of the Highway's entry into Surrey, the Highway crosses into the Township of Langley. There are four interchanges on Highway 1 in its 18 km (11 mi) long stretch through Langley. One leads to 200 St, Langley's major thoroughfare, an HOV-only interchange leads to 202 St, another leads to Highway 10, and the final leads to Highway 13. Construction is also currently underway on another interchange within Langley at 216 St.
Highway 1 then crosses from Metro Vancouver into the Fraser Valley Regional District upon entry into Abbotsford. There are six interchanges on Highway 1 in its 33 km (21 mi) long stretch through Abbotsford, one of which leads to Highway 11. Once Highway 1 leaves Abbotsford, it crosses over the Vedder Canal into Chilliwack. The highway goes through Chilliwack for 24 km (15 mi), passing through six interchanges within the city (Yale Road West, Lickman Road, Evans Road, Vedder Road, Prest Road, and Annis Road). An exit to Young Road is also available westbound on the highway. 2 km (1¼ mi) after leaving Chilliwack, Highway 1 reaches an interchange with Highway 9. East of the Highway 9 interchange, Highway 1 hugs the south bank of the Fraser River for 35 km (22 mi), passing through seven interchanges until reaching the interchange with Highway 3 at Hope, British Columbia. Highway 1 takes the exit off the freeway at this point. (The freeway alignments of Highways 3 and 5 continue from this exit, from Exit 170 Highway 5 continues as a freeway until it meets up again with Highway 1 just west of Kamloops at Exit 362.) Most traffic travelling between Hope and Kamloops follows Highway 5 as it takes over an hour and a half less time to travel compared to following Highway 1. Highway 1 just east of Kamloops heading westbound. In the Kootenays, Highway 1 originally went around the Rogers Pass (British Columbia) area in its section from Revelstoke to Golden along what was known as the Big Bend Highway. In 1962, the section of Highway between Revelstoke and Golden was re-routed through Rogers Pass. This realignment reduced the travelling distance between the two towns by more than 160 km. Over the 1970s and 1980s, Highway 1's alignment between Hope and Cache Creek underwent a massive overhaul, including new tunnels and river spans. In Kamloops, a new bypass was constructed to re-route traffic on Highway 1 around the downtown area of the city. The Interior section of Highway 1 is 695 km (432 mi) long, and closely follows the path of the Canadian Pacific Railway. After leaving the freeway, Highway 1 courses through the town centre of Hope for 2 km (1¼ mi) before heading north across the Fraser River. At this point, Highway 1 becomes two lanes. 1 km (about ½ mi) north of the Fraser crossing, Highway 1 reaches its east junction with Highway 7. Continuing from the Highway 7 junction, Highway 1 goes 106 km (66 mi) north on a route that includes seven mountain tunnels, past the communities of Yale, Spuzzum and Boston Bar, before reaching its junction with Highway 12 at Lytton. Leaving the Fraser River, and following the Thompson River another 37 km (23 mi) northeast, Highway 1 reaches a junction with another numbered route, Highway 8. 38 km (24 mi) north of the Highway 8 junction, Highway 1 passes through a junction with Highway 97C. Continuing 5 km (3.1 mi) north, the highway reaches the community of Cache Creek, where Highway 97 merges onto the Trans-Canada from the north. East of Cache Creek, Highways 1 and 97 proceed on their common alignment for 72 km (45 mi), passing through Savona en route to Kamloops. Highway 5 merges onto the Trans-Canada from the south at this point, returning the freeway to Highway 1. The 1/97/5 concurrency proceeds east for 12 km (7.5 mi) on a freeway through the western part of Kamloops to where Highway 5 diverges north. Highways 1 and 97 leave Kamloops to the east 7 km (4.3 mi) later. The highway continues east for another 19 km (12 mi) to Monte Creek, where the freeway ends and Highway 97 diverges south from Highway 1. For the next 52 km (32 mi) east, Highway 1 takes a winding two-lane route through the communities of Pritchard, Chase and Sorrento. The highway widens to four lanes just east of Sorrento and remains in this alignment for the next 30 km (19 mi) before reaching the city of Salmon Arm on Shuswap Lake. Highway 97B meets Highway 1 three kilometres east of Salmon Arm's city centre. The peak of Rogers Pass. After Salmon Arm, Highway 1 goes east for 31 km (19 mi) to a junction with Highway 97A at Sicamous, following the south shore of the Salmon Arm of the Shuswap Lakes for most of this stretch. Over the next 71 km (44 mi) east, Highway 1 winds through the communities of Malakwa (the highway widens to four lanes as it passes through Malakwa), Craigellachie and the Three Valley Gap, before reaching its junction with Highway 23 at Revelstoke, on the Columbia River. The next 148 km (92 mi) of Highway 1 to Golden winds east through Mount Revelstoke National Park and Glacier National Park, where the Rogers Pass area is located. There are eight snow sheds on Highway 1 between Revelstoke and Golden—three of them lie west of Rogers Pass, while five lie to the east. Motorists are advised to check their fuel level as they are leaving either Revelstoke or Golden as there are no refuelling facilities between the two towns. After Glacier National Park and a time zone boundary crossing, Highway 1 passes over the Columbia River again at Donald, and then reaches its junction with Highway 95 at Golden. 73 km (45 mi) east of Golden, after Highway 1 has passed through Yoho National Park and the community of Field, Highway 1 crosses the Continental Divide (via Kicking Horse Pass) into Alberta. Partial-at grade intersection with northbound flyover to Hwy 19 north. Terminal Avenue to Hwy 19A north – Parksville, Campbell River Hwy 1 branches northeast. Hwy 1 exits freeway using Exit 3. 57.76 92 Hwy 11 (Sumas Way) – Mission, USA Border Closest the Trans-Canada Highway gets to the US border in Western Canada. East end of freeway • Hwy 1 exits freeway using Exit 170. 271.13 West end of freeway • Hwy 1 / Hwy 97 exits freeway using Exit 362. ^ TranBC (June 9, 2011). "Highway of Heroes". Ministry of Transportation and Infrastructure. Government of British Columbia. Retrieved March 9, 2018. ^ "Frontier to Freeway – A short illustrated history of the roads in British Columbia". British Columbia Ministry of Transportation. Retrieved October 22, 2009. ^ Landmark Kilometre Inventory (PDF). British Columbia Ministry of Transportation and Infrastructure (Report). Cypher Consulting. July 2016. pp. 399–402. ^ "McKenzie Interchange". Infrastructure and Transportation. Province of British Columbia. Retrieved February 27, 2017. ^ a b "Highway 1 and 216th Interchange Project". Ministry of Transportation and Infrastructure. Province of British Columbia. Retrieved March 8, 2017. ^ a b "Highway 1 - Hoffman's Bluff to Jade Mountain". Ministry of Transportation and Infrastructure. Province of British Columbia. Retrieved January 18, 2018. ^ "Highway 1 - Salmon Arm West". Ministry of Transportation and Infrastructure. Province of British Columbia. Retrieved January 18, 2018. ^ "Phase 3 Design Updated - Highway 95 Interchange" (PDF). Kicking Horse Canyon Project. B.C. Ministry of Transportation and Infrastructure. April 15, 2008. Retrieved June 28, 2016. Wikimedia Commons has media related to British Columbia Highway 1. This page was last edited on 19 January 2019, at 16:48 (UTC).